Promotion is a big part of the success of marketing activities including product launches, business openings, sales and deals, trade shows and exhibit participation. Some promotional undertakings demand a wide range of execution or require a huge scope of resources, finances, and connections. With this, most businesses resort to joint promotions to make the activity more feasible and possible. If you intend to get your business into joint promotions, it is important for you to always put everything into writing. Aside from website hosting agreement checklist and benchmarking considerations checklist, you can also develop a checklist for drafting joint promotion agreements if your marketing undertakings require or suggest you do so. A checklist for drafting joint promotion agreements is necessary as you need to be aware of what to put in the joint promotion agreement that will be honored and implemented once both parties have already signed the document. If you have no idea on how to create a checklist that you can use for drafting the content of your joint promotion agreements, then make sure to give your full attention when browsing through this post. Why is There a Need for a Checklist When Drafting Joint Promotion Agreements? A joint promotion agreement checklist can ensure that all the items that are expected to be in the document are present. A comprehensive joint promotion agreement works best so you have to make sure that you will come up with a document that is complete with all the information necessary for the transaction. A team meeting checklist may also be necessary if you want to discuss the content development of your joint promotion agreement with the members of the team and the management. A joint promotion agreement checklist can help you to be more organized. Since there are a lot of clauses that are necessary to be seen in a joint promotion agreement, you may have a hard time in terms of logically arranging all the items that you would like to include in the document. If you have a joint promotion agreement checklist at hand, it will be easier for you to identify the flow of the discussion within the joint promotion agreement that you would like to create. The date when you plan to develop the joint promotion agreement. The names, basic information and contact details of the entities involved in the joint promotion. The list of the products, services, items and other offers that will be promoted. The benefits that you can get from the agreement and the responsibilities attached to these. The specification of the promotional license grant. The statement of tie-in promotion creation and development. The terms, conditions, scope, and limitations of the joint promotion agreement. The possible ways on how the terms of the agreement related to the joint promotion may be extended. The timeline that will be followed by the joint promotion. The fee, promotion and advertising cost, compensation, and other financial data that is necessary to be included in the document. The processes of auditing that will take place to ensure that all the deliverable expected from all parties will be given and used to their maximum potential. The list of the responsibilities and obligations of each party with one another. The activities or instances that can serve as the grounds for termination of the joint promotion agreement. Just like while developing a business meeting agenda, you have to ensure that you have a strong foundation or a guide when you are already prepared to create a joint promotion agreement. With this, we suggest you use a checklist. 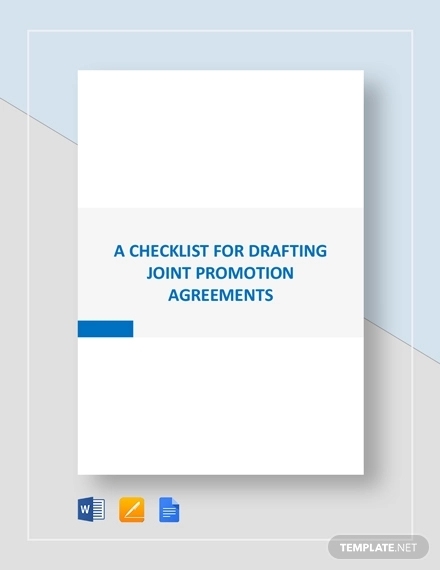 Listed below are some of the tips that can help you develop an efficient and effective joint promotion agreement draft checklist. Ensure that you will precisely identify the details of the parties that will work together on the effectiveness of the joint promotion agreement. As much as possible, all contact information must be updated. Since most joint promotions are done in a business to business relationship setting, you have to include the specific person who serves as the representative of the businesses involved in the joint promotion activities. Properly define the property or any other resources involved in the joint promotion implementation. It is important for you to precisely discuss the responsibilities of each party. Their deliverable shall be listed in minute details so that no misleading information may occur. This can lessen disputes and misunderstandings in the future. Be specific with the inclusions of the joint promotion. It is essential for you to have the limitations when it comes to promoting specific items that will benefit the parties involved. This can set the grounds for what is included in the activity and the others that each party can just take care of themselves. Properly define the marketplace, market niche or territory where the activities present in the agreement will occur. Understanding of this matter can make the entire joint promotion be more effective. If you will set all the records straight and direct to the point, parties who will immerse themselves in the joint promotion agreement can set proper expectations. More so, this will help them to respect each other even more in terms of what they can provide to the table and what the can get or receive out of the transaction. Having a checklist can easily give you a backbone that you can rely on once you would like to develop the draft of the joint promotion agreement already. Do not make it hard for you to create a joint promotion agreement draft. Use samples and templates as your formatting guides when necessary. Also, these items will help you identify the content that you should discuss in the document. Be keen when developing your drafting checklist so making the actual joint promotion agreement will just be like a walk in the park.